And we’re keeping with the literary theme of last week, I thought we might go a little further back in time, both with the forger and the subject. The forger? Thomas Chatterton. The subject? Forged Medieval poetry (oh wow yes, how exciting! I know, I know, try to control your excitement people). Chatterton, like Ireland, initially used his forged documents to impress a father figure replacement, in Chatterton’s case the usher at his boarding school, writing a fifteenth century romance and passing it off as authentic at the tender age of 12. Unlike Ireland, Chatterton created a whole new persona to claim credit for the poems, a fifteenth century poet named Thomas Rowley. He wrote several romances and poems as Rowley, and submitted them to several patrons who offered to publish them. During his lifetime the publications of “Rowley’s” poems were badly received, but upon Chatterton’s death and the subsequent suspicions surrounding these poems he managed to mysteriously collect, the poems became successful virtually overnight (the eternal struggle of artists everywhere). He was also meant to be a very successful mimic, and even tried his hand at political writings. Ok, ok, so not all that remarkable right? What if I told you that he died at the ripe old age of 17 from arsenic poisoning? More interesting right? Arsenic in and of itself plays an interesting role in the history of art, but that’s another post for another day. 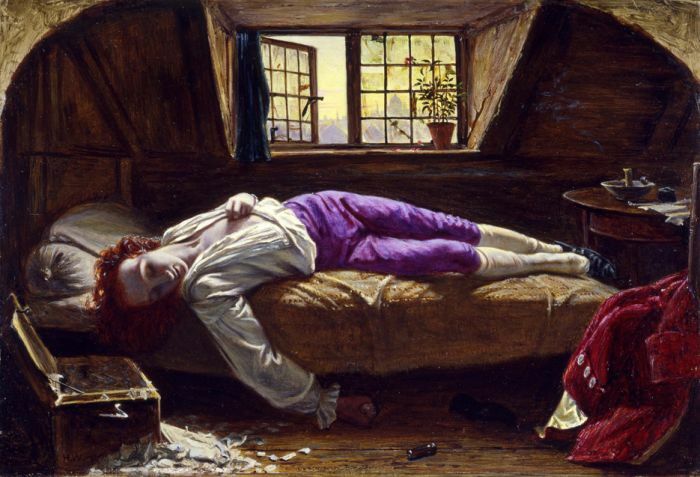 Posthumously Chatterton’s genius was recognized, and he was a particular favorite of the Pre-Raphaelite Brotherhood, becoming a symbol of under appreciated talent. Which I am sure you aware is a common theme throughout Pre-Raphaelite anything.